What do you want to get out of it? Do you expect to sell a particular amount of inventory at the trade show or expect to become known to a certain number of wholesale suppliers? Are you focusing on promotion or hoping to launch a new product? Or are you trying to position your company for a possible sale? You can have more than one goal, of course, but the point is that you need to be clear about what your participation in the trade show is going to achieve. 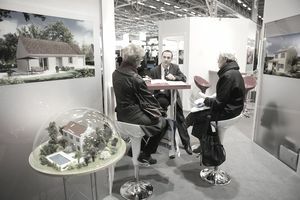 You need to choose the trade shows that will give your business the best return on investment in terms of your goals. If your goal is on-site sales, having a booth at that big splashy trade show where your trade show display is one of a dozen selling similar products may not be the best choice. You want to choose the trade show that best targets the audience that you want to reach and best suits your participation goals. Find out what the particular trade show's objectives are and investigate and evaluate the trade show's audience. Find out everything you can about your space, including where it is on the floor, what kind of other trade show displays will be around it, whether it's a high traffic or low traffic area, and the physical conditions of your trade show display space, such as lighting. Book your space as early as possible — many trade shows offer substantial early booking discounts over those booked within a month or so of the event. Based on your budget decide how much booth space you will need for your display. It is nice to have a large display but a smaller, simpler booth can be just as effective — after all the goal is to make connections and gain new customers. Who is it that you're targeting with your trade show display? Retail customers? Wholesale buyers? Other businesses in your industry? Different audiences "shop" trade shows differently and have different needs. Put the word out that you're participating in a particular trade show by inviting your clients, customers, suppliers, and other contacts to attend the show. (Be sure you give them all the details, such as your booth number.) If you have one, be sure to advertise your coming trade show attendance on your website as well.